Down the Rabbit Hole is the tale of 13-year-old Ingrid Levin-Hill, an ordinary girl with a love of soccer, acting and Sherlock Holmes. She lives in desolate Echo Falls, where mystery is never far away. Ingrid begins investigating the death of a resident in Echo Falls, while trying to land the lead role in a local production of Alice and Wonderland. One thing leads to another, as Ingrid finds herself caught in a web of lies and secrets. She finds life in Echo Falls to become curiouser and curiouser; will she ever escape? This book is amazing … It is a sad story but I think it’s great for all readers. I’m 12 and the books do look big but you read them so fast. It’s got some bits that made me cry and other that stopped my heart from beating I loved this book and you will too. The first book of the awesome Hunger Games triology, Katniss Everdeen steps up for her sister to the cold-hearted, merciless Hunger Games. It is truly a game of kill or be killed. Allies will be made, broken hearts, and a killer awaits… one who none can overthrow, in its own game of cat and mouse. Time for Trailer Tuesday, an occasional regular feature. “One day you’re in, and the next day you’re out” – Heidi Klum. The first trailer for The Avengers (the superhero group consisting of Captain America, Thor, Iron Man, and a few others without their own movies sadly but may have had bit parts in other films, who can remember, frankly?) is out. It is directed by Joss Whedon, who came up with Buffy. So it might be good! But he’s also responsible for The Dollhouse, so it might not be that good! (Sorry, Joss). Anyway, here it is. A new trailer for the forthcoming Muppet film can be viewed here (along with all the others). It (the film, not the trailer) contains ‘mild rude humor,’ so you might want to be discrete. War Horse, a Steven Spielberg film based on a Michael Morpurgo book, has a pretty epic trailer. At last; a film that will delight people who like horsies as well as fans of war films. Here is a selection of newly arrived fiction. Completely randomly a theme emerged in the tower of new books, which makes for some serious reading. First sentence: I had just come to accept that my life would be ordinary when extraordinary things began to happen. My Sister Lives on the Mantelpiece, Annabel Pitcher (226 pages) – The title is a reference to Jamie’s sister’s ashes. Five years on from her death, the family is still struggling to come to terms. Jamie’s father drinks, and his mother has left, and Jamie is trying to make sense of the tragedy. First sentence: My sister Rose lives on the mantelpiece. Hades, Alexandra Adornetto (422 pages) – the sequel to Halo. Bethany is tricked, and finds herself in Hades (the underworld), Jake is back in town, and is going after Xavier, to get at Bethany. So to spare Xavier’s life, must Bethany make the ultimate sacrifice? First sentence: When the final bell sounded at Bryce Hamilton, Xavier and I gathered our things and headed out onto the south lawn. She Loves You, She Loves You Not, Julie Anne Peters (278 pages) – Alyssa is disowned by her father, so she must move away from her girlfriend Sarah, to live with her mother who she doesn’t know in a new town, starting over again (and trying not to repeat the mistakes of the past). First sentence: The night Sarah and Ben showed up out of the blue. Sorta Like a Rock Star, Matthew Quick (355 pages) – Amber, her mother, and her dog, live in the back of the school bus her mother drives (one of those big yellow buses). Even so, Amber is an optimist, visiting people in a nursing home, and teaching English to Korean women, but then something terrible happens that tips Amber over the edge into depression. The Girl is Murder, Kathryn Miller Haines (342 pages) – set in New York in 1942. Iris’ father owns a detective agency, so naturally she is dead keen to help him on some of his cases. When he refuses to let her – and he’s working on a case involving a boy at her school – she decides to do some secret detective work of her own. Putting Makeup on Dead People, Jen Violi (326 pages) – Donna’s father has been dead for four years and she’s never really got over it. Then one day, she discovers a calling to become a mortician. A story of “how one girl learns to grieve and say good-bye, turn loss into a gift, and let herself be exceptional” (cover). First sentence: I’m mixing a can of tomato soup with a can of two percent milk for dinner that no one will eat. A Scary Scene in a Scary Movie, Matt Blackstone (248 pages) – Rene is an obsessive-compulsive superhero in the making, convinced he is responsible for bad things that happen by doing things in the wrong order, or moving at the wrong time. He has one friend, Gio, who is determined to teach him how to “play it cool” – one imagines Gio has his work cut out for him. First sentence: Legs are my favorite part. First sentence: It’s a little after two a.m. I thought a little fashion DIY was in order this week. What a better thing to do during the holidays than make things – or make yourself over! 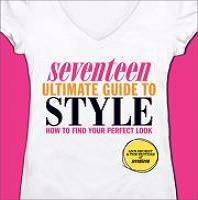 First up is this new book from Seventeen mag, ‘Seventeen ultimate guide to style: how to find your perfect look’. It has all you need to style yourself according to their useful (and kinda hilarious) categories – boho, indie, glam, classic, edgy and girly. As well as having all the requisite pretty pictures, I actually found it had some good, practical advice. Adaptable to suit your ‘lifestyle’ too! The second thing I saw that I thought would make a good little project are these instructions on how to make a beaded collar . Now you may have noticed elaborate fashiony-collars are everywhere. And as I am quite taken with the sequinned ones, I’ll be trying to make one for sure! And finally, if you’re puzzled by how others can style their hair so effortlessly you might find this cool little video on how to make a bun very helpful. Goliath, Scott Westerfeld – if you’ve been reading the Leviathan trilogy (Leviathan, Behemoth), then reserve this one! Can Alek and Deryn end the war? Who is the dangerous stranger on board the Leviathan? When will Alek figure out that Deryn is a girl? Kill All Enemies, Melvin Burgess – if you like realistic fiction that’s quite challenging, then Melvin Burgess is your man. This tells the story of three teens with troubled backgrounds, one the daughter of an alcoholic, one who has an abusive stepdad, and one who is at odds with his middle-class upbringing. Here’s a review from the Guardian. Bitterblue, Kristin Cashore – Kristin Cashore recently announced on her blog that Bitterblue, the sequel to Graceling will be published in May 2012, so this is advance warning. Read what she has to say about getting the book published, and other things, here. Clockwork Prince, Cassandra Clare – and finally, the second in the Infernal Devices trilogy (after Clockwork Angel), will be published in December. With the help of Jem and Will, Tessa must uncover the mystery around the Magister’s hatred of the Shadowhunters, but their every move in their search appears to be anticipated: have they been betrayed? Reserve Clockwork Prince now and get ahead in the queue! There’s a new Tintin trailer out and it looks sooo action packed and exciting! Watch the first (more subdued) one here. 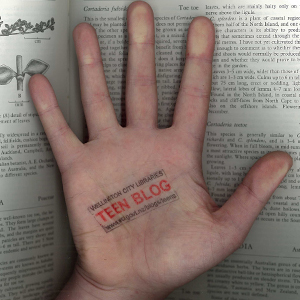 This blog is mostly about items in the “Young Adult” area of the library and the trailer below is about a movie called “Young Adult”, just ideal really. Fans of either dance movies and exploding buses should be entertained by the new Footloose movie. Yes, a bus explodes. See you next time at the movies! Here’s the top ten most reserved young adult items for October. Enjoy! Also new and popular in town: Hades, by Alexandra Adornetto (sequel to Halo), All These Things I’ve Done by Gabrielle Zevin, and Miss Peregrine’s Home for Peculiar Children. Plus also, also Ouran High School Host Club 7 and Vampire Knight 13. Kanye West’s much anticipated and talked about womenswear collection was just shown in Paris. And reactions have been mixed – from The Times’ Lisa Armstrong’s somewhat harsh ‘Stick to the Day Job’, to The Cut’s Amy Odell kindly weighing up the positives and the negatives of the clothes. The New York Times article ‘Kanye West, Designer (Yawn)’ – OUCH! – looks at various fashion editors reactions, including US Vogue’s Anna Wintor. But the fabulous Anna Dello Russo (Japan Vogue editor – DUH!) seemed quite positive, donning this Dw outfit hot off the catwalk. So while I think it looked a bit weird and ill-fitting, it’s safe to assume Kanye hasn’t suffered a Lindsay Lohan for Ungaro style crash-and-burn. Let’s enjoy his day job then, as an entertaining and stylish rapper.